People in the Sandwich Generation are struggling to meet the needs of their growing or adult children and the needs of their aging parents while usually managing a hectic work schedule as well. Anyone who is sandwiched between two generations can usually sum up their state of mind in one word “exhausted”! Take care of yourself FIRST! You do a great disservice to yourself, your partner and your marriage if the stress overload is too great and you burn out. Take your direction from your local airline emergency manual: if the oxygen mask drops, it specifically tells you to PUT YOUR MASK ON FIRST, THEN ASSIST THOSE AROUND YOU! This is good advice! It’s hard to fully assist those around you if you do not first put on your oxygen and BREATH! You are no good to anyone if you are overburdened with guilt and stress. Highly stressed individuals are less effective and less efficient. Don’t neglect your own family to take care of an elderly parent. Caring for an elderly family member is important, but so are your spouse and children. They need focused time and attention from you. There are many resources available to assist you in the care of an elderly family member, utilize them! Caring for your parent is a family affair. Other siblings as well as children who are close to their grandparents may be willing to help. Being a martyr is not healthy for anyone, ask for help! You’d be amazed at who steps up to the plate. If the older adult is able to, involve them in the process of finding resources or looking at housing options. Give them information on options available for future care needs that they might have. DON’T WAIT FOR THE EMERGENCY!! Educate yourself on resources available in your community! Waiting for an emergency (and trust me it will happen at some point) creates an atmosphere of chaos. You do not want to be making important decisions for a loved one in reaction to an emergency. Take time for your marriage. Go out once a week with your spouse, doing something you both enjoy. Make a special effort to increase the amount of intimate time together. Don’t let your marriage become a victim of the emotional fallout from the pressures of multi-generational caregiving. Caring for family young and old can be both a blessing and a burden. Caring for yourself will not only assist you in facilitating work/life balance, it will give you the strength to better assist those you love. 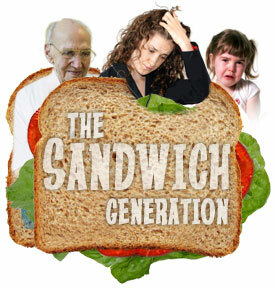 This entry was posted in aging, boomers, caregiving, eldercare, encouragement, health care, sandwich generation, work/life/flex, working caregiver and tagged aging, baby boomers, boomers, caregivers, caregiving, eldercare, encouragement, family, health care, healthcare, sandwich generation, sandwiched between children and parents, work/life/flex, working caregiver. Bookmark the permalink.